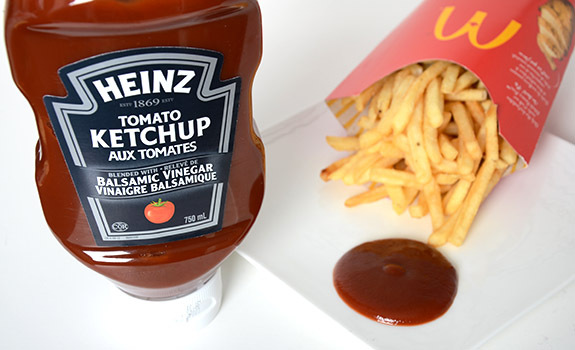 A bottle of Heinz Tomato Ketchup Blended with Balsamic Vinegar, paired with the quintessential fast-food fries. Sometimes, food brand extensions are magic. For example, Honey Nut Cheerios are fantastic, but regular Cheerios do nothing for me. Other times, brand extensions are useless additions to a store’s shelf space, the kind of thing that seemed like a good idea at the time to the R&D and marketing types who created them. Witness any number of the thousands of failed products each year that show up in grocery stores, then promptly vanish when the cold hard sales figures come in. I wasn’t sure which category this newish Heinz Tomato Ketchup Blended with Balsamic Vinegar fit into, so I figured I’d buy a bottle and play judge. While I have a feeling that messing with something as popular and near-perfect at Heinz ketchup is a recipe for disaster, I also have an open mind. The Pitch: From the website: “Instead of white vinegar, this version of our classic ketchup is blended with balsamic vinegar for a more sophisticated taste.” Logically, it makes sense. I’ve been known to put ketchup and white vinegar on fries (like the good Canadian I am), so adding a different type of vinegar should theoretically work. I love balsamic vinegar, and I love ketchup, so on paper this is a match made in heaven. The Look: Same squeeze bottle as regular Heinz Tomato Ketchup, but with a classy black label. The colour of the ketchup is slightly darker (more dull, less vivid is how I’d describe it) than the ketchup I’m used to. The Taste: I sampled these with some fries from McDonald’s. There’s certainly a curious extra punch to the flavour, with a sharp acidity and caramel notes. There’s no mistaking the difference. That said, I find it almost more of a cider or malt vinegar taste instead of what I’d consider to be balsamic. This is probably because they’re not using a particularly nice (or even borderline legit) balsamic vinegar to make it. I thought I liked it until I tried it next to regular Heinz Tomato Ketchup. The “balsamic” element drowns out all the flavours in the regular Heinz ketchup that make it different from other ketchups, and the vinegar emphasis robs the ketchup of its pleasant sweetness. You lose that Heinz ketchup taste, which is a shame. Cost: $4.28 for a 750 mL bottle at Calgary Co-op. Value for cash money: On par. Same price as the regular Heinz tomato ketchup, which was surprising. The verdict: Different, but not particularly good. With fries, a burger or a hotdog, it’s a change of pace. There’s also some potential as an alternative ketchup in recipes that call for ketchup as an ingredient. I’m just a bit concerned that a 750 mL bottle of the stuff is overkill, and I can see it languishing in my fridge – especially since I already have a bottle of standard Heinz ketchup in there. I have to agree! I bought a bottle just the other day when I saw it on the shelf. I was excited because I love vinegar…..love ketchup and love balsamic vinegar and use one of them almost everyday. I was really excited to try…..but totally underwhelmed. Didn’t really have a balsamic taste at all….kinda strange taste….smokey?? Anyway, I have a big bottle in my fridge and it’ll likely be there for some time. The more I tasted it with fries and/or other things, the more I noticed how much I missed the regular Heinz taste. It doesn’t taste like balsamic anything. It tastes like a sour, flat cider vinegar or cheap wine vinegar (the $2.50 per bottle variety they sell at grocery stores), not balsamic. Disappointing, to say the least. I’ve given it a chance repeatedly, but I’m just about ready to dump it so I can fit a bottle of regular Heinz back into the fridge.